Our August Wallace Eyecare Associates staff utilizes the latest techniques and equipment for vision testing your 'over 40' vision issues, including Digital Retinal Imaging (evaluates the health of your retina and detects diseases such as diabetes and macular degeneration) and Refractive Surgery C-Management (tests for LASIK, PRK or Cataract Surgery) Learn about the different types of tests and equipment you may experience on a visit to August Wallace Eyecare Associates. Along with age's greater level of awareness &amp; wisdom comes greater personal care. 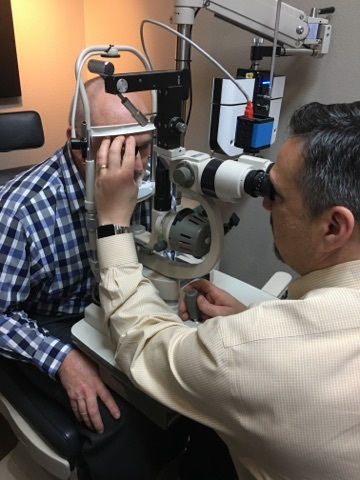 However, for many of those who plan ahead and schedule annual eye exams with their local optometrist, eye health can be managed and prevent the development of eye and vision problems. For those who have a family history of glaucoma, macular degeneration, diabetes, or high blood pressure, prevention is key to maintaining long lasting vision. Multifocal lenses are meant for those over 40 who struggle with presbyopia - the age-related near vision loss that requires us to use eyeglasses for reading and focusing on objects in our near vision.They enable you to correct for near and distance vision with one pair of glasses. If you are in search of occupational bifocal and trifocals - golfing glasses, reading and computer glasses, E-D trifocals, Double-D bifocals - stop by our Longview, TX office! Progressive lenses are multifocal lenses that offer a complete vision solution in one pair of eyeglasses – with no lines bisecting the lenses.